Like I mentioned in a post a few days ago, we had two days planned to spend inside Yellowstone National Park but the boys had other ideas. So, today turned out to be a day to spend having some fun outside the park and it was great. We started by not starting too early. We’ve had a lot of early starts in this trip to keep up the pace so taking a later start was a well deserved treat, for all of us. First stop for the day was the Grizzly and Wolf Discovery Center. This is a rescue center and refuge for these animals and will provide the closest view you can safely get of grizzles. Fun part for the boys was that they have an educational program here for kids. 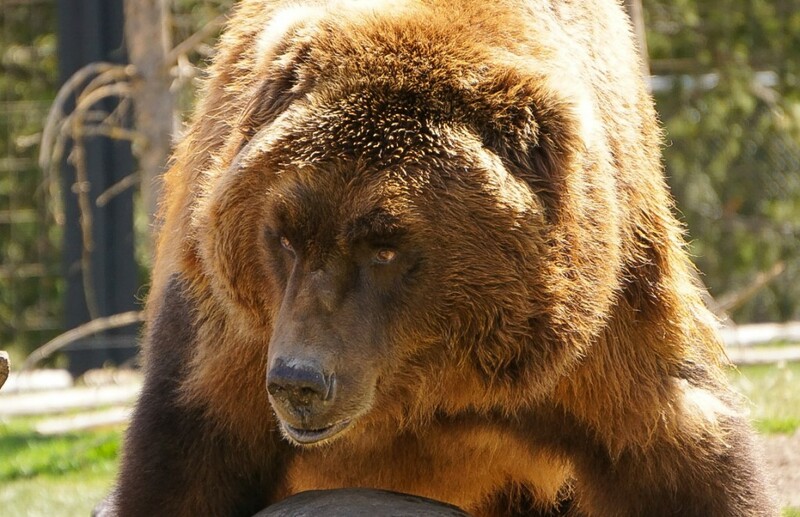 Part of this program involves the kids going inside the bear habitat and hiding food. Then they get to watch as the bear are returned to the habitat and search out the food. 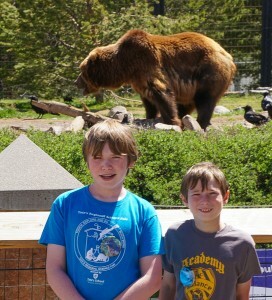 This photo shows the boys in front of “Sam”, searching for food, a one thousand pound grizzly originally from Alaska. They had a lot of fun with that. 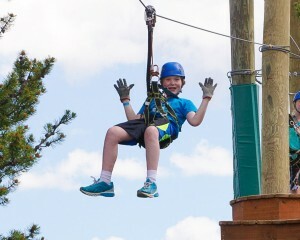 Next stop was something Collin’s been begging us to do since the day we got here, zip lines! We’d been driving right past this place every time we come or go from the campground since we arrived here. Finally he gets his fun. 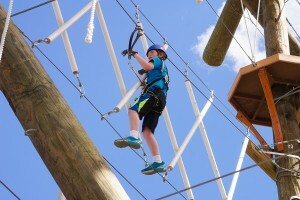 This adventure park fun included an aerial climbing arena as well as zip lines. 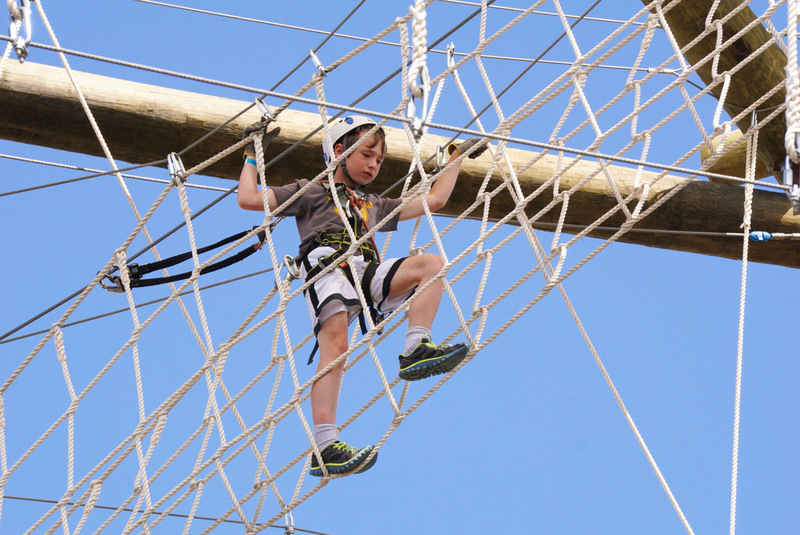 You must go through the aerial arena in order to get to the zip lines. 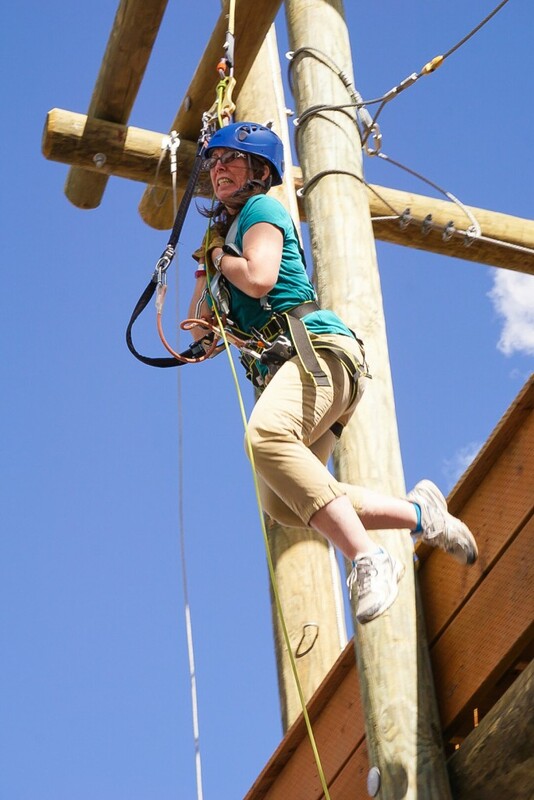 You can get down without using the zip lines but at that point why would you? 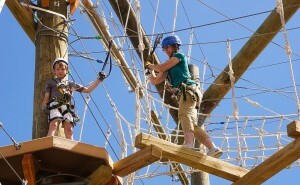 I did all of it with them once, reluctantly (I hate heights), then sat out and grabbed pictures while they went through again. Everyone’s arms were beat by the end of this afternoon. 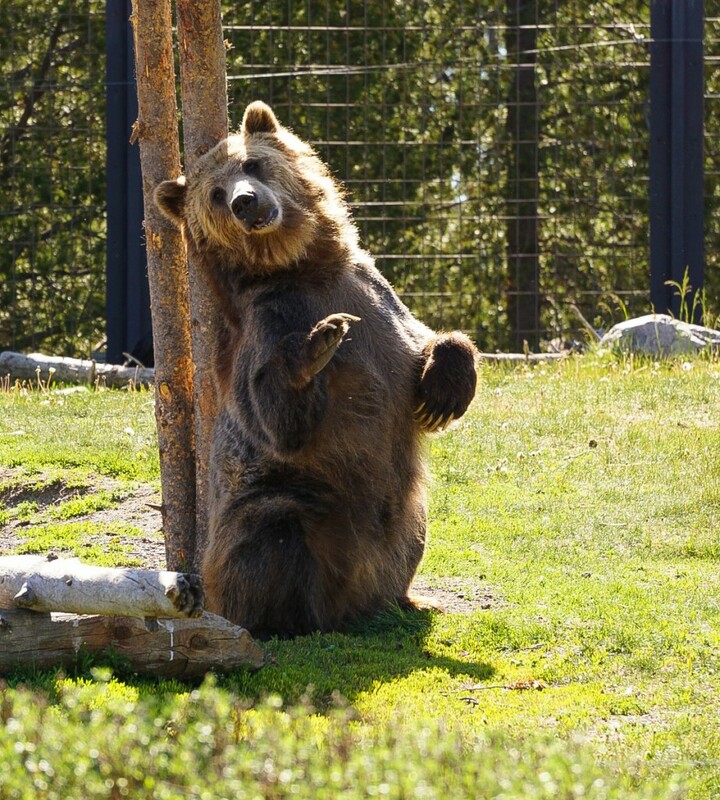 This bear was really enjoying that scratching post! 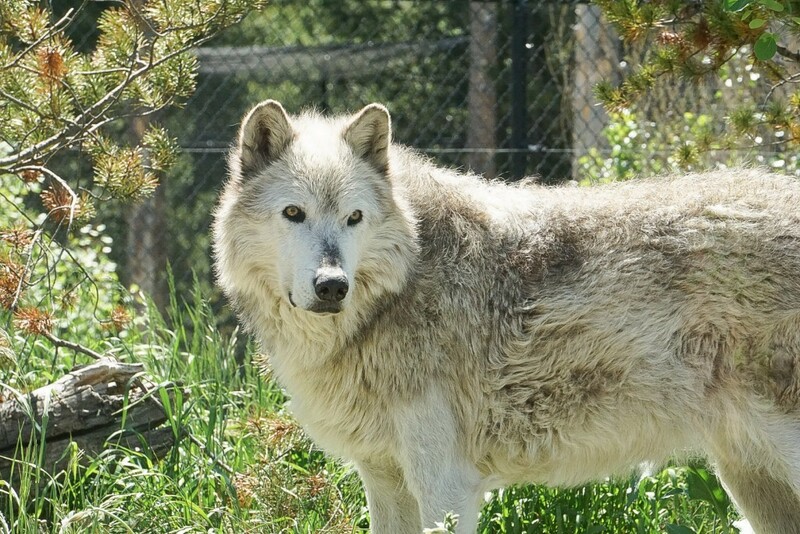 A beautiful wolf at the Grizzly & Wolf Discovery Center. 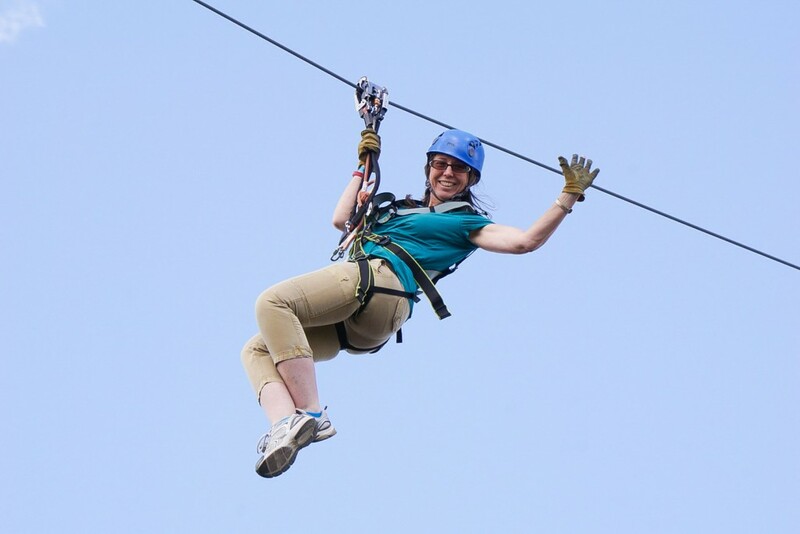 Dawnie flying down a zip line. 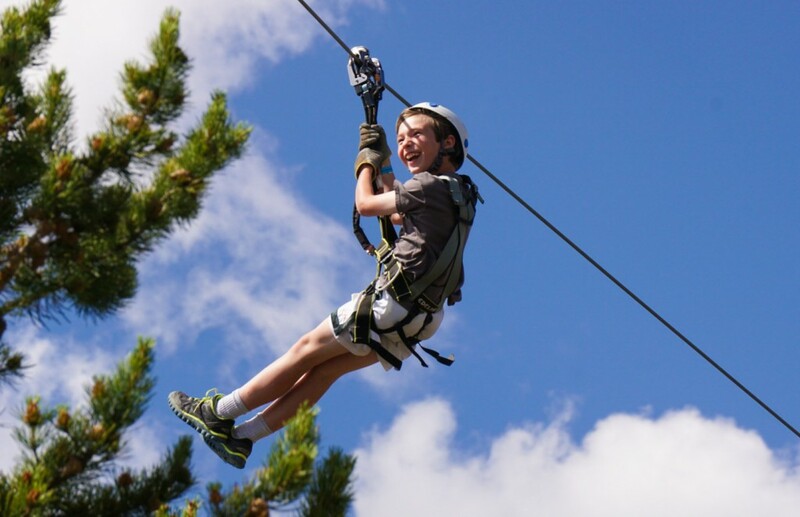 This entry was posted in Destinations, Northwest, West Yellowstone, Wyoming and tagged climbing, Grizzly & Wolf Discovery Center, grizzly bear, West Yellowstone, wolf, zip line. Bookmark the permalink. Too bad there aren’t more parks like this one. excellent publish, very informative. I’m wondering why the opposite experts of this sector do not notice this. You should proceed your writing. I’m confident, you have a great readers’ base already!